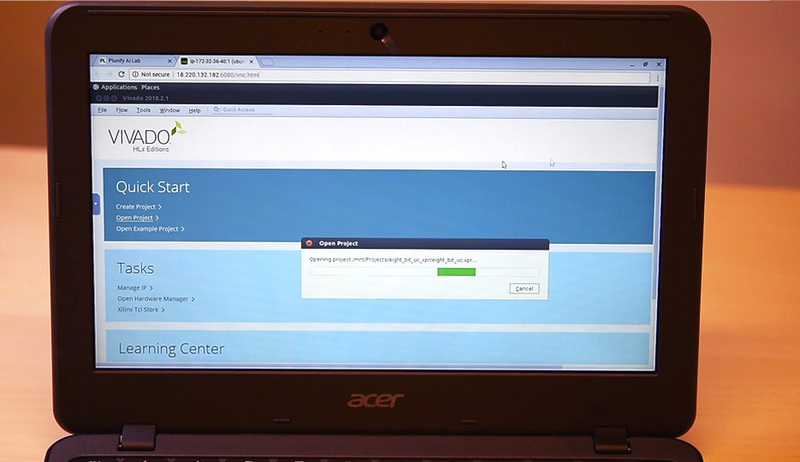 You may think that it’s impossible to run Vivado on a lightweight machine like a Chromebook. After all, FPGA design is a compute-heavy task that is only practical with your company’s workstations and high-performance servers. So how do we do it? Okay, we confess; We can’t bend the laws of physics so we are not really running Vivado on Chromebooks. What we are doing is to use Plunify’s AI Lab to launch cloud servers pre-installed with Vivado and then access the entire development environment with just a browser. This works perfectly for a machine like a Chromebook, where the browser is main “portal” to what you want to do. So you can fix an RTL bug, easily re-build your design, collaborate with a friend while having coffee at your favorite cafe. We built AI Lab for FPGA design engineers. Not everyone is an IT expert and not everyone wants to fiddle with the knobs to access the cloud. AI Lab is a virtual environment where you don’t have to install anything, except a browser. Our secret sauce is to combine high-performance AWS cloud servers with the ease-of-use of a web browser. To begin, register a Plunify Cloud account. This is an account with which you can use different cloud applications, but today we focus only on AI Lab. Next, log on to the AI Lab web portal with your credentials. The steps shown below were executed on my little Acer N16Q13 Chromebook. On the webpage, you will see options for tools and cloud servers. Select your preferred ones and click “Launch” to start the virtual development environment. Your virtual environment will be up and running in a minute or two. Simply click the “Access via web browser” link on the left to access it directly from the web browser and then input the password provided. And you are in! Within this virtual desktop, a Vivado shortcut awaits. Launch the software and use it just as you would normally do it on a workstation. Design files can be sync-ed between the web portal and the virtual environment. The entire process takes only a few clicks and there is hardly any learning curve. For the very first time in FPGA design history, everyone can run Vivado and utilize this advanced FPGA design tool without being constrained by time, location, and compute power limitations. You are probably wondering if AI Lab costs a lot. Don’t worry, we want users to have the flexibility of hourly charging for the servers as well as the tools, so an exclusive on-demand and unlimited Vivado license is available on Plunify Cloud. See this table for a detailed cost breakdown. AI Lab is a web application within Plunify Cloud. It leverages AWS security measures and adds extra layers of user authentication as well as file transfer security on top of existing frameworks. Network firewalls and VPCs enable private networks and control access to servers and applications. There is data encryption in transit with TLS for your design files, and also at rest on AWS storage and database services. AI Lab enables users to run Vivado on any machine, and is easy to learn. Therefore it is a great fit for individual FPGA designers or anyone who is keen to gain real-world FPGA design experience at low cost. Unsurprisingly, universities and educational institutions constitute the first group of AI Lab users who leverage this virtual environment to train students. With a course equipped with AI Lab, students can access course content and practice with their personal laptops anywhere at any time. The lecturer and teaching assistants on the other hand, save a great deal of time and effort on setting up the lab environment – time which is much better spent crafting the teaching materials. One recent user is a top science and design university in Singapore who used AI Lab to conduct a popular Artificial Intelligence on FPGAs class. Subscribe to our blog to read about what they did! You may also register a Plunify Cloud account here to try AI Lab immediately.